Generator (Chocolate Factory) LLP has submitted a full planning application, under reference 15/06400/F to Bristol City Council for the redevelopment of the former Elizabeth Shaw Chocolate Factory in Greenbank. The details are on their website at http://www.chocolatefactorybristol.com/downloads.aspx. Bristol Cycling Campaign has submitted detailed a detailed response highlighting the lack of cycle parking and shortcomings in the travel plan. 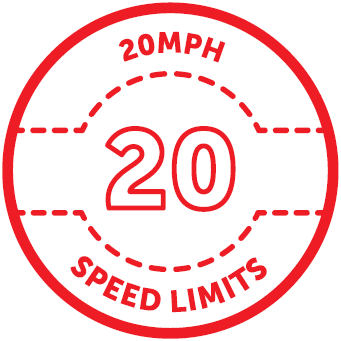 Following the success of the “Keep and extend 20mph limits” petition with over 4,000 signatures, there was a full council debate on March 15th. We put in a written submission in support BCyC Statement March2016 Keeping and extending Bristol 20mph Areas. There was ‘shock and awe’ when the Bristol Post came out in support as well. They seemed to have been swayed by the arguments that Bristol’s Better at 20. We have produced a Manifesto for 2016 Mayoral Elections setting out key questions for the elections on May 5th. This is part of our Space for Cycling campaign. You can add your voice to the campaign by signing the petition. See also our manifesto for candidates standing for the Council, and for the Police and Crime Commissioner. The only proven way to deliver this is to provide a continuous and dedicated cycling network, to Triple A standards – for All Ages and Abilities. Our Mayor and council must have a transforming vision for cycling, and the political will to make it easy for our choices to be good for us and good for our city. We are calling on candidates to create Space for Cycling, for the benefit of everyone. Will you set up a Space for Cycling Inner Loop connecting Clifton Triangle, St James Barton, Temple Circus, Redcliffe roundabout, new Arnolfini Bridge and Jacob’s Wells roundabout? Will you plan to Get Bristol Moving by making the best use of the limited capacity of our streets and roads so that 80% of trips can be healthy and sustainable (40% walking, 20% public transport, and 20% cycling)? Will you prioritise Funding for Cycling with sustained investment of £16 per head, and an aspiration for £25 per head? Also ensure that 10% of the council transport budget delivers clear benefits for cycling. Will you open up our Streets for All through a ‘good transport plan’ in every neighbourhood? Residential areas should have low speeds, continuous pavements across side streets, no rat running and all streets open for cycling. Will you take every opportunity to create Space for Cycling on busy or fast roads and junctions, with ‘Triple A’ standards for All Ages and Abilities, so that there are safe routes to school, to work, to shop, and to green spaces? Will you plan for Living Hearts for the centre and our neighbourhoods? This means public spaces at the centres of our neighbourhoods where people are the priority, and are not dominated by through motor traffic. We have produced a BCyC Manifesto for 2016 Council Elections candidates setting out key questions for the elections on May 5th. This is part of our Space for Cycling campaign. You can add your voice to the campaign by signing the petition. See also our manifesto for candidates standing for the Mayor, and for the Police and Crime Commissioner. Our councillors must work to help create an environment whereby it is easier for us to make choices that are good for us, good for our neighbourhood, and good for our city. We are calling on candidates and councillors to support Space for Cycling, for the benefit of everyone. Will you work to make your ward and neighbourhood a better place to cycle and walk, so that people can travel safely to work, to school, to shop, to play, and to green spaces? Will you do all you can to deliver the specific improvement in your ward identified at bristolcyclingcampaign.org.uk/wards? Will you support and help produce a good transport plan for your ward and neighbourhood which puts people first, and particularly the young, the old and the disadvantaged? Streets for All in residential areas means low speeds, continuous pavements across side streets, no rat running or through traffic, and all streets open for cycling, including one-way contraflows. Will you press for Space for Cycling in your ward generally? This means protected space on high volume and 30mph roads and at busy junctions. It means accepting no less than ‘Triple A’ standards of design, construction & maintenance, for All Ages and Abilities. It means having safe routes to school, to work, to shops, and to green spaces. Will you work towards a Living Heart for your neighbourhood? This means public spaces that are not dominated by through motor traffic, that have plenty of cycle parking and where people are the priority, not traffic. Do you recognise that some changes will be controversial and will you stand up for those with most to gain but whose voices are often not heard – the young, the old and the disadvantaged?